The wedding is a season finale staple, and Jane The Virgin has had three different weddings in its three season finales. In the first season, Rogelio and Xiomara got drunk married in Vegas by a Cher impersonator. The second ended with the long-awaited wedding of Jane and Michael, a beautiful day that turned tragic when Michael was shot later than night. Rogelio and Xo are getting married once again this week, but their fairy tale moment gets severely downgraded when outside forces come into play. A hurricane hitting Miami forces them to cancel their most extravagant plans, but even more pressing is the return of Darci Factor, who is seven months pregnant with Rogelio’s daughter. Jane is already stressed about getting everything together for the wedding before the whole thing flies off the rails, and when it rains, it pours. She has to scramble to work around the hurricane and write something personal for the ceremony, which adds another complication when she learns that Michael wrote her a love letter before they were married. She’s fixated on finding the letter, but before she can begin her search, a bombshell drops in her lap. By becoming ordained for the wedding, it’s like Jane is asking the universe to send someone her way with a big confession, which it does when a very pregnant Darci Factor gets in her car. Darci wants Jane to tell Rogelio about the baby because he’ll take the news better from her, and the wedding is put on hold when Jane passes the information along. As someone that loved the Rogelio/Darci relationship, I’m thrilled to see Darci back on this series in a role that ensures she’ll remain a lasting presence throughout. Having her return with Rogelio’s unborn child introduces another major obstacle for Rogelio and Xo to overcome before their wedding, and it creates a lot of intriguing story possibilities for the future now that the couple is firmly tied to Rogelio’s ex. But they’ll make it through it. Rogelio and Xo have a love that can withstand any storm, and realizing this is what helps Jane find the words for her speech at the ceremony. That and seeing her new book being advertised on the bus, a twist of fate that reminds her that good things come to those who work hard and don’t give up. Jane doesn’t believe in destiny after losing the man she thought she was going to be with for her entire life. So much of the language surrounding romance involves people being meant for each other, but that makes love too easy for Jane. She’s grown up with fairy tales and telenovelas that perpetuate this idea, but after experiencing the reality of romance, Jane recognizes that it takes a lot of effort to make relationships work. Rogelio and Xo aren’t getting married because they are meant to be, but because they chose each other in the face of a million obstacles. When it seemed like they should give up, they kept choosing each other. They’ve suffered together and endured together, and each new twist in their relationship reaffirmed that they had made the right choice. Fate may have brought them together after decades apart, but they stayed together because they put in the work. Gina Rodriguez does great work capturing Jane’s admiration for her parents in this moment, and she views their love as something aspirational. Her own personal situation also reflects her mother’s, as Jane is currently dealing with rekindled feelings for the father of her child. She’s trying to fight her attraction to Rafael, but she can’t do it and Petra can see that. This puts Rafael and Petra’s reunion in jeopardy, and it takes very little time for Petra’s old jealousy to return when she sees Jane’s bliss when Rafael hugs her. This is the reason Petra didn’t want to get back together in the first place, and she doesn’t want to always feel like she’s competing with Jane for Rafael’s affections. Petra still has another option in the form of Chuck Chesser, who is still pining for her, but she can’t escape the allure of Rafael. Detours are a major theme in this episode, and when Petra and Jane decide they are going to tell Rafael about their feelings, they both get pulled away at the last minute. Petra by her scheming sister, and Jane by Michael’s letter, which is delivered to The Marbella by the tenant that moved into Jane and Michael’s new house. Brett Dier returns for flashbacks this week, and I get all warm inside every time he shows up on screen (and when he reads Michael’s love letter at the end of the episode). Michael was so lovable, and seeing him in new scenes with Jane and Alba makes me remember what he brought to the series and the hole he left behind that is still empty. It makes sense to bring Dier back for an episode that has Jane discovering a new message from her late husband, and the viewers get to experience that swell of emotion with Jane as we get to spend a bit more time with Michael. While Michael will always be a part of Jane’s life, the letter provides Jane with the last bit of closure she needs, allowing her to embark on the next phase of her love life. The Narrator says that Jane believes in destiny after tonight, which makes me think that Jane’s chance encounter with her first love, Adam (Tyler Posey), at the end of this episode might lead to a long-term relationship. The paper cranes create a fairy tale visual when the wind sweeps them up, but they have deeper significance because they symbolize healing. Jane is still suffering from the pain of losing Michael, and the confluence of a wedding, an unexpected pregnancy, and a letter from the past reopens old wounds. Having Adam be the person that delivers the note is a very convenient twist in the story, but it works at the end of an episode that is all about coincidences and destiny and finding the person you’re supposed to be with. Jane and Adam have found their way back to each other, but that’s just the first step in the uphill climb of sustaining a romance. The mystery of who killed Scott has steadily drifted into the background over the second half of the season, and the reveal isn’t especially noteworthy. The real Eileen killed Scott because he saw her right after seeing Rose posing as Eileen in The Marbella, and she put an end to him before he could figure out what was going on. On its own, this revelation would land with a thud, but it becomes a highlight of the finale when paired with Dexy’s Midnight Runners’ “Come On Eileen.” The song starts immediately after Luisa exclaims, “Come on, Eileen? !” when Rose tells her what really happened with Scott’s death, and continues for the entire flashback, with the chorus kicking in when Eileen hits Scott with the murder weapon. It’s a hilarious moment, and it’s refreshing to see one of the main dramatic storylines end with a surprising burst of humor. 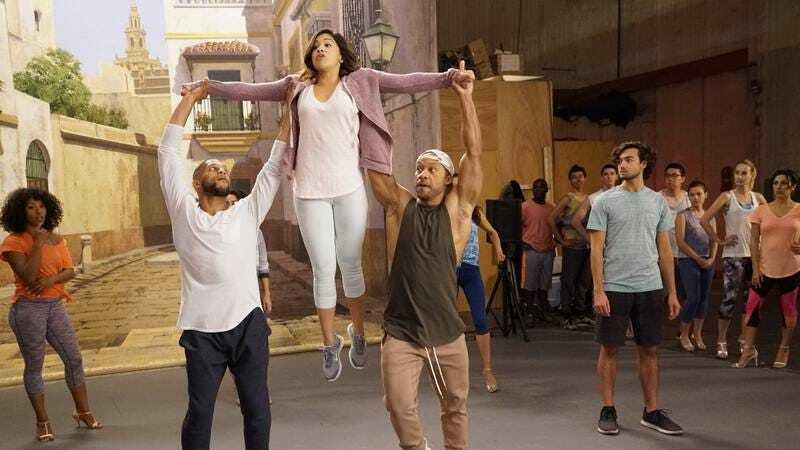 While Rose is behind bars, Luisa begins to step into a more active villain role when she finds out that Rafael lied about his cancer, which leads to a major confrontation that destroys what’s left of their already unstable relationship. Luisa is furious at her brother, and when she ends up sharing a cab with Anezka, who is furious at her sister, the two quickly form a mutually beneficial bond. Luisa tells Anezka she was roofied by Petra and Anezka reveals the addendum to Luisa’s father’s will that leaves Rafael broke, and the #TwistedSisters make their own power plays with this information at the end of the episode. Anezka pulls a gun on Petra after using Rafael’s phone to lure her to an isolated location, and Luisa corners Rafael in his apartment, where she reveals that she knows about the addendum and is taking over The Marbella. I’m particularly excited to see where this Luisa story goes next season, and it might finally be time for Yara Martinez to join the cast as a regular. After a season full of heartbreak, I’m glad that co-writers Jennie Snyder Urman and Paul Sciarrotta deliver a finale that focuses on the positive things that have happened for these characters. The opening is a montage of mostly happy events from the series’ past, reminding the viewers of the good times these characters have shared and the trials they’ve overcome together. Juanes’ “Una Flor” is the song that plays throughout the Jane The Virgin premiere, and playing it at the wedding reinforces how far this series has come since “Chapter One.” So much has changed for these characters, and through it all, the show has never lost its heart, wit, style, and charm. Ivonne Coll is very talented at making Alba feel like a big presence in an episode when she doesn’t actually have much screen. The speech she gives to Xo right before the wedding is overflowing with affection, and even though Alba can be judgmental, it’s clear that she has a deep respect for who her daughter has become after all of her struggles. I love the peeks at the over-the-top wedding Rogelio and Xo would have had if things went the way they had planned: the dance number, the dress with the Princess Diana train. This show has used a tropical storm as a plot device in the past (“Chapter Ten”), but the stormy weather metaphor works so well for this episode that I don’t mind that the writers return to the same well. Of course the first man in Jane’s love life would be named Adam. She’s a good Catholic girl after all. Would you let Jane into your home to check under the floorboards for a love letter from her late husband? Jane’s purple dress would be so much better without that beading across the chest, which makes it feel very high school homecoming. Given how much product placement this show has incorporated for Jane’s Chevy Cruze, I’m surprised that a tree was dropped on it this episode. “Oh, right. Luisa used to be a doctor!” I love when the Narrator remembers that Luisa used to be a doctor.